Rumah Sakit Akademik Universitas Gadjah Mada – RSA UGM or referred to as “RS UGM” is a rapid sustainable state university hospital in Indonesia. 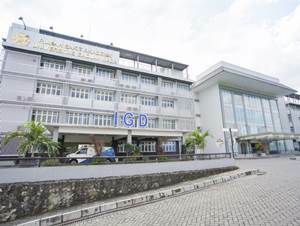 The Hospital is owned by Gadjah Mada University (UGM), one of the largest state universities in Indonesia. RS UGM is based in Sleman Yogyakarta and registered at Jl Kabupaten, Kronggahan, Trihanggo, Gamping, Sleman 55291. According to information found in RSA UGM’s website as cited by JobsCDC.com, RSA UGM was first established in 2010 as Hospital Akademik. RSA UGM was formed under Regulation Rector No 69 / P / SK / HT / 2010 dated 4 January 2010. The name of Rumah Sakit Akademik Universitas Gadjah Mada officially launched in 2014 based on Regulation Rector No 749/ P / SK / HT / 2014 dated 20 October 2014.